Over the past few years, there has been plenty written on the changes in Canada’s national museums. 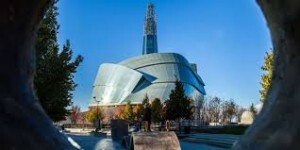 A good deal of the focus has been on the renovations to the newly re-named Canadian Museum of History, but there has also been plenty of news out of Winnipeg and the new Canadian Museum for Human Rights. There have been questions related to the turnover in staff, the freedom granted to researchers, and the narrative used in publications. For as much as these have shaped the museum’s first year, however, they have been covered elsewhere and are not the focus here. During the Canadian Historical Association Annual meeting, several curators from the Canadian Museum for Human Rights presented a panel on the visitor experience and exhibit construction at the museum. The discussion largely centered on the museum’s efforts to use first-person accounts and create an innovative environment for visitors. In this episode of the History Slam, I talk with Jodi Giesbrecht, manager of research and curation at the Canadian Museum for Human Rights. We chat about the geography of the building, the creation of the exhibits, and the challenges of presenting difficult material in an engaging manner.